Derrick Barnes is the author of nine books for children, the most recent being Crown: An Ode to the Fresh Cut. The book, which has been voted one of the best books of the year by NPR, is among the first wave of titles published by acclaimed writer Denene Millner’s new children’s book imprint, housed within Agate books. 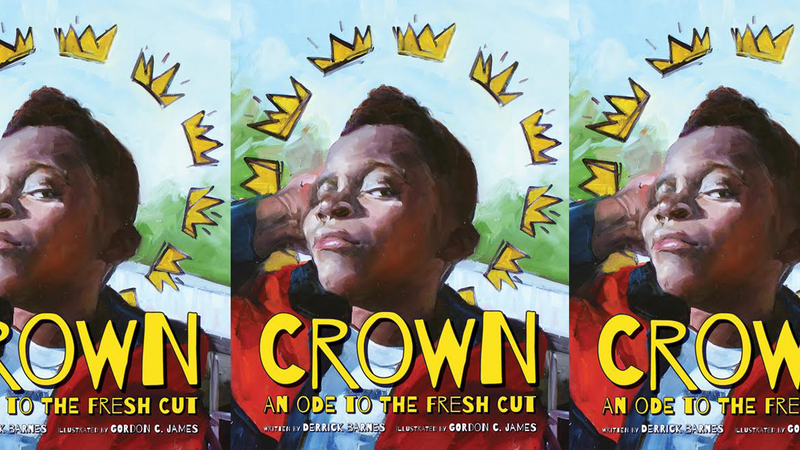 In Crown, Barnes explores the role of the barbershop in the black community in creating a safe space for black youths, instilling within them self-esteem and pride in their blackness. “He’ll drape you like royalty with that cape to keep the fine hairs off of your neck and your princely robes,” Barnes writes in Crown. “It’s amazing what a tight fade, high/low/bald does for your confidence: Dark Caesar.” Here, Barnes’ language affirms the sacredness of the fresh-cut experience, which allows young black men to feel like kings. Barnes, who began his writing career as the first black male writer for Hallmark, quickly parlayed that experience into a multibook deal with Scholastic, a major children’s book publisher. Also a proud husband, father, activist and HBCU graduate, Barnes cites all of those influences for the success of his work. The Root sat down with Barnes to discuss writing, the greatness of HBCUs, the need for diverse books—and, of course, the importance of a fresh cut. The Root: What is the story behind Crown? Derrick Barnes: I saw a sketch one of my Facebook friends did of his teen son after coming home from the barber. The cut was fresh! I was inspired to write a poem because the cut made me think about being in the sixth grade and catching the bus to the barbershop on Thursday evenings. TR: What is the importance of a fresh cut? DB: When I got up out of that chair, I felt smarter, more handsome and more important—like I could take over the world, you know? I wanted to capture all of those positive, self-affirming feelings and throw a regal twist on top of it. TR: What instilled your love of reading and writing? DB: I think just being poor. I’ve always had an imagination, but reading sparked and heightened that imagination. I’d hang a flash light from the pole in my closet, grab a couple of pillows, and make a cozy little reading nook and knock out book after book. The first thing that I remember writing was a short story about a group of stray dogs trekking across the country looking for a lost magical bone at 10 years old. But I didn’t know that I wanted to be a professional writer until I had my first paid gig as a columnist for the Jackson State University Blue and White Flash. TR: Jackson State University is a wonderful HBCU. How did attending an HBCU influence you? DB: I felt the history every day that I was on the campus of Jackson State University. Lots of affirming messages, lots of encouragement to go out into the world and dominate and conquer. I really felt like I could be some kind of influential writer that could utilize my voice to be a change agent, a difference-maker. Plus, I met my best friends and the love of my life and the eventual mother of my four sons (the “Mighty Barnes Brothers”) on “the yard.” It was the greatest period of my life. TR: Did your experience at an HCBU inspire your commitment to writing for black children? DB: Yes. I respect and feel honored to be a writer in the great lineage of black writers that came before me. I care about the work that I put into the world and how that work inspires children—makes them feel better about themselves and the world around them. When all of this is over, your two greatest legacies will be your family and your work as an artist. TR: What kinds of books do children need? DB: The easy answer, especially for children of color, would be for them to read books that mirror their own lives. And while that may be absolutely true, children, especially black children, need books that stretch their imagination. They need books that will challenge the way that they see the world. They also need books about people that came before them that may have lived harrowing lives but beat the odds, that challenged the system, and that fought revolutionary fights in order to bring about change in their lives and the collective lives of others. TR: Can you talk a little bit about diversity and children’s literature and publishing? DB: The Cooperative Children’s Book Center School of Education at the University of Wisconsin, Madison, puts out a staggering report on the dearth of characters of color in children’s books every year. There has been a gradual increase in books written by and about black people. I love that. But there needs to be diversity on all levels of publishing. And although books about our history and pivotal figures from African-American history are important, I want to see an increase of “slice of life” books just featuring black people being people. Not slaves, basketball players and civil rights workers exclusively. I want them in fantasy books, falling in love, being awkward, heroic, “wimpy,” whatever. The same stories and tales that are afforded to white writers and characters. TR: What would your advice be to young black aspiring children’s book writers? DB: My advice would be, as told to me by one of my mentors, Dr. Alfred Tatum of the University of Illinois at Chicago, would be to write “unapologetically.” Write your own truths, from your own point of views and experiences. TR: As a parent and an engaged citizen, how do you process the rise of intolerance and violence against people of color and other marginalized individuals in America right now? DB: I’m hopeful. Sometimes we have to get out of our comfort zone, which I feel like we were in the past eight years, and be pushed to the limits, pushed to activism. We’re definitely at that point now. Because of the current climate created by this presidential administration, I think people of color, in particular black folks, are seeking places they can go to feel appreciated and not fear for their safety and face obstacles towards their growth, but places where we can flourish. We need to bond together. Support each other economically and financially. The American public system has failed us for decades. If we keep depending on it to educate and raise our babies, things will only get worse. TR: You are known as a writer, public speaker and activist. How do you navigate all these roles? DB: They feed each other well. My writing is always centered around the positive upliftment of black people, the positive upliftment and interaction of human beings. I won’t apologize for my love of black people, nor for wanting to see us do better educationwise, economically and as a community. As an artist, I have a prominent role to play in that improvement. I always say that a better black America will make for a better America. My role as a husband, father and writer will always be centered around playing my part to make things better.